As a former Carlisle United player, Mansfield Town manager Adam Murray has sent his best wishes to the Cumbrians whose town and football ground is under flood water once more after being hammered by Storm Desmond. The club’s home ground, Brunton Park, close to both the rivers Petteril and Eden, has been engulfed by flood water for the second time in 11 years. Click HERE to see the ground under water. Click HERE to see Carlisle players, including ex-Stag Michael Raynes helping local residents. “It is horrendous. For a town that is so tightly-knit up there, it hits them hard,” said Murray. “I can remember last time it happened just before I signed and the effect it had for months and months, not just the ruining of homes and buildings, but for the individuals it affects them as you build something up and it gets knocked down again. It does take years to get back. “As a football club our thoughts go out to all the people up there. The way they are as people and as a town it will make them stronger. 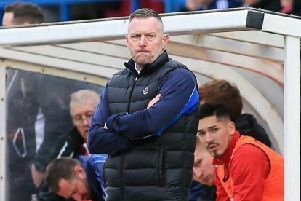 Carlisle are now managed by former Stags boss Keith Curle, and the club’s players have this week offered to help any local residents in any way they can with the clear-up.